- Cloning ORF of gene of interests (GOI) into a rAAV cis vector with a reporter. - Design and synthesize ~6 shRNA oligoes followed by cloning them to the above rAAV cis construct to obtain shRNA validation plasmids. 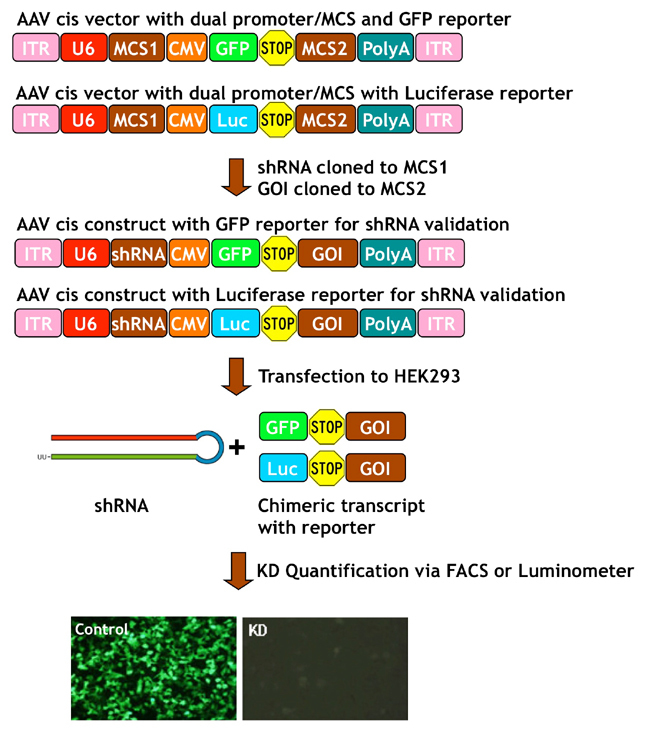 - For miRNA validation, synthesize pre-miRNA oligoes followed by cloning them to the above rAAV cis construct to obtain shRNA validation plasmid. - Transient transfection the shRNA/miRNA validation plasmids. We guarantee at least 1 (one) shRNA with >80% knockdown of mRNA level in the tested cells by screening ~6 shRNA/miRNA oligoes. Figure 1. A Cartoon Showing shRNA Validation Process for shRNA rAAV Production.